Brownie Pops are fun, playful candies that combine two favorite tastes into one great candy. Brownies and chocolate frosting are mixed and formed into balls that are placed on sticks and dipped in chocolate. These “pops” taste like decadent fudgy brownies and make perfect party food or favors! My favorite part is that they taste great with store-bought brownies (or brownies from a mix), so there's not a lot of advanced prep that needs to happen in order to make these perfect pops. Try adding in fun mix-ins too, like chopped nuts or mini chocolate chips. Hungry for more? 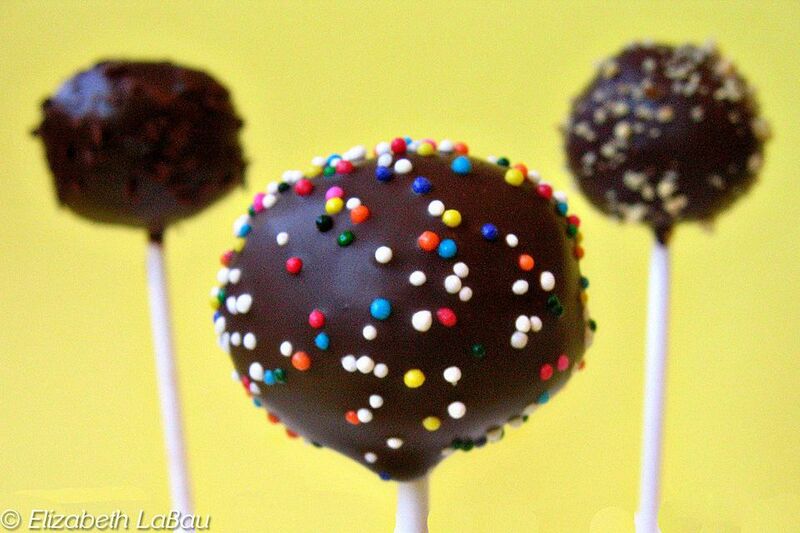 Don't miss the full list of cake pop candies here. Place the brownies in a large bowl, and crumble them roughly with your hands. Add the chocolate frosting, and begin to mix it with your hands into the brownies, working until the brownies are crumbs and the mixture is evenly moistened. You want the brownie mixture to easily hold together when you press it into a ball, but still retain a little texture. My personal preference is to have some “crumb” left to the brownie, so that it is not just a gooey frosting ball. Of course, tastes vary, so add more frosting if you want a fudgier pop. Using a cookie scoop or teaspoon, form the mixture into small balls and roll them between your hands to get them round. Place them on the prepared baking sheet and freeze until firm, at least 2 hours. After the pops have been frozen, remove them from the freezer. Melt the chocolate candy coating in the microwave and stir until completely smooth. Use a skewer to poke a hole in the bottom of each brownie ball. Dip the end of a lollipop stick into the melted coating, then stick this end into the hole made by the skewer, to help hold the stick in place. To prevent cracks from forming in the chocolate coating, you want to dip the brownie pops when they have lost some of their coldness from the freezer, but do not allow them to get so warm that they fall off the lollipop stick when being dipped. I’ve found that a moderately cool temperature is best. Dip the pops one at a time in the coating, holding the dipped pop over the bowl and allowing excess coating to drip back in the bowl. While the coating is still tacky but no longer dripping, sprinkle the desired toppings (nuts, coconut, sprinkles, etc) on the brownie pop before setting it on a baking sheet to finish setting. Alternately, you can stick the pops upright in Styrofoam to allow them to finish drying. Brownie Pops can be served immediately, or they will keep in an airtight container in the refrigerator for up to one week. The chocolate coating will get softer as time progresses. Allow to come to room temperature for best taste and texture when serving.